No matter how crappy your day was after an hour of jumping, bouncing and cavorting, there’s no way you won’t be walking out a much happier camper. Talk about a no-brainer: It’s soooo much cheaper than therapy (only $14/hr) plus you’ll be burning mucho calories! Consider HOA for corporate team building, a cool birthday party for kids, if you want to pick up some mad skills before skiing, surfing or whatever, or as an alternative exercise program if you’re tired of climbing the Stairmaster to nowhere. This place is huge. 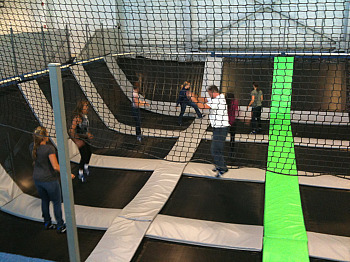 The only place that comes close is Trampolinea in New York. Their main big-boy structure ( bigger than a basketball court) The Matrix, is made up of 42 conjoined trampolines. They also offer an innovative 2X (Double) Bowl freestyle trampoline concept modeled after skateboard park designs, perf for action sport types and described by one of the owners, Dave Schaeffer, as “really gnarley”. The Colosseum, 22 conjoined trampolines running all the way up the side walls, will be used for team sports such as trampoline dodgeball and basketball. There are also trampoline areas available for the little one starting at 3 years old as well as their “Training Ground” performance-based classes geared toward professional athletes. House of Air is located in a historic airplane hangar from 1921 at 926 Mason St. in the San Francisco Presidio with plenty of free parking. There’s also going to be a cutting edge retail outlet as well as an on-site healthy cafe.